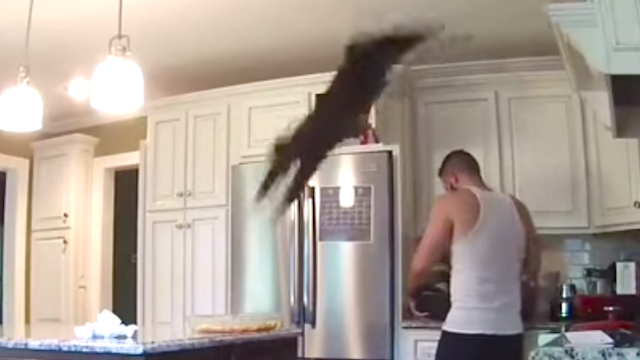 Watch this jerk cat straight-up destroy its owner's chicken dinner and laugh and laugh. The messed up thing is the cat doesn't even eat any of it! Goddamn cats! I mean, really! I've had cats drink out of my water glass, chomp out of my pasta bowl, and steal my underwear. Pretty much any kind of mayhem a small animal can stir up in a home, my cats have done. But using a tray full of raw chicken as a launchpad is truly next-level life-f*ckery. My hat's off to this cat, as well as to its owner for not immediately chasing it through the house while screaming his head off. Deep breath. Okay, the real question is: do you think he still put that chicken in the oven? It looks like it's just marinating there... And the heat would burn everything off... It's just, nothing is unsalvageable, ya know? He's definitely thinking about it at the end there. That's when the dude slinks over and covers the security camera with that copy of The New Yorker.